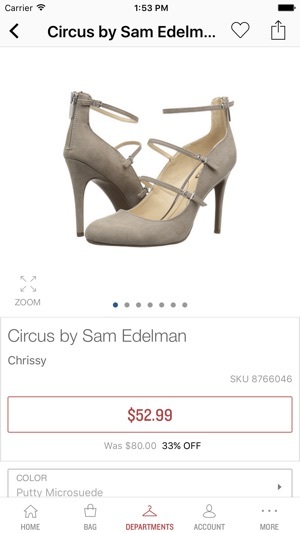 The 6pm.com App puts the top brands and deals you love in your pocket. Shop and browse the latest fashion trends and sales from wherever you are! Score everything from shoes to clothing to handbags and more – all on sale. Plus, get free shipping when you order $50 or more! 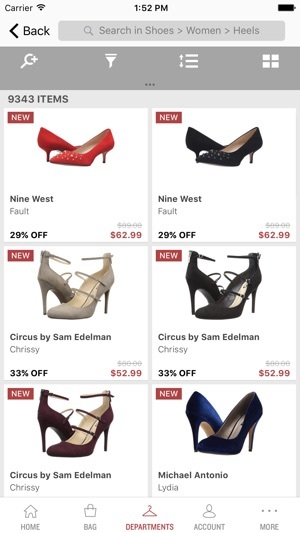 • Fashion Finds: Easily browse the latest fashion from 1000s of brand names. • Featured Deals: Never miss out on an amazing deal. • Quick Search: Convenient search and filter features help you find what you want fast. 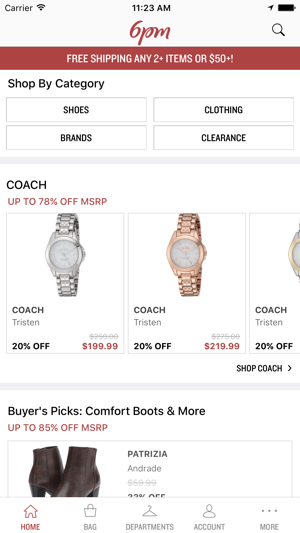 It’s never been easier to get fashion and deals in your pocket. Download the 6pm mobile app and give it a try!!! Some of you were being logged out a little too soon. Sorry about that we fixed it. 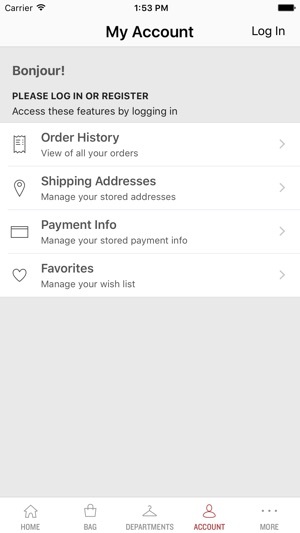 For the novice or the experienced online shopper, clear organization and ease of searching and sorting items to find the item(s) desired are important; the 6pm website nails this. By identifying first the main categories into which its products are arranged and then by second suggesting the multiple filters the shopper can (read should) apply, one can rapidly narrow the search from thousands of potential items to the few dozen that are most likely to fit the the occasion or purpose. And the site, like its competitors, suggests alternative selections that are similar or comparable once the shopper begins viewing specific items, which mimics an in store experience with a clerk selecting alternatives. Where this site may exceed some of its most famous competition is in the high quality of its products. The items I've purchased and viewed on 6pm have been all top brands. Incredible Service!! My #1 shopping app!! I’ve been shopping at 6pm for several years now from the website, not only have I had nothing but awesome experiences with shopping for them, my most recent purchase was by far most IMPRESSIVE! I ordered two items Friday night choosing the CHEAPEST shipping option expecting the items to come a week later just in time for my vacation, but my order actually arrived just TWO DAYS late on a SUNDAY! Not only have I ever heard of a company delivering items on a Sunday, but I was more than elated with that my items came much earlier than expected but also my items fit perfectly according to description. Also side note, one of my items was listed about $20 cheaper than another discounted designer website so also a major plus for 6pm! HIGHLY RECOMMEND! The 6pm app is one of the most detail oriented shopping applications you will find in the App Store. Not only is the app easy to browse but provides the user with a filtering system that makes search quick and painless. With a concentration on fashion users can mine down their search by applying price, brand, color, style, gender as well as a myriad of other details that can be used to display what you are specifically looking for. Users can even save their search for later by adding a title so the process can be made even more convenient when shopping in the future. Push notifications for deals can also be set so users can stay on top of the latest deals and promotions. 6pm is an app in the vein of Zappos and Size that works well as a complimentary or even main source for well priced quality athletic wear.